and alas the wife was not a big fan! to a newly SINGLE man. Just a bad poem, not real life. The girls don't mind what I smoke as long as I remain locked in my office. I'll bet ladies especially love Old Bill when he smokes SWRA, whether he's locked in his office or not. At least that's always been my experience. Will get you one from point B to point A. You'll enjoy the ride the whole way. Ladies love aros the way Cupid shoots arrows. when a gentleman masters the pipe smoker's arts. Has raised more than one woman's top of the halter-kind. The most beautiful babies have been conceived while a bowl of SWRA has burnt out on a nightstand. I'm the kind of gent who is happy to hold hands on the first date. Other people like hook-ups and Tinder, nowadays. I leave the rest of this poem up to your imagination. Smoke SWRA when you've got it, you won't regret it. It's the best tobacco to smoke out in public when you're looking for a mate. Where have all the bad poets gone? Have the PSF literary critics been too fixed on being mean? Give a poet chance even if he's all alone, no matter what doggerel he'll spawn. Maybe the poets are smoking a good pipe. They don't feel like writing. They don't feel like jotting their thoughts onto paper. Maybe their bad poems aren't yet ripe for type. They're too focused on their charring lighting. They are formulating how to describe the latest VaPer. Where have all the bad pipes poets gone? Where the spring flowers are, maybe. 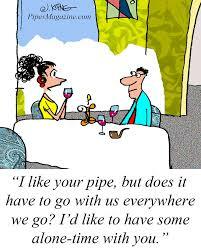 Where has all the pipe poetry gone? Tossed with the ash, the way the bathwater that was tossed out with the baby. Maybe this thread needs a smackdown to generate interest. We're talking poetry so we can't feature pictures like on Pinterest. They knew how to put down the smack. Let's get those dope pipe rhymes running! Smoke on air will play, another pipe another day! I sat with a pipe on my stoop. I don’t think he was looking for soup. Than listening to a boy band named after tripe. There is all sorts of digested cud swirling around this short poem. This damn Savinelli has left me forsaken.